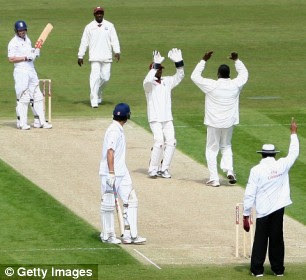 Why are cricketers these days so demonstrative when they disagree with an umpire's decision to give them out? In the old days, they just tucked their bat and walked off. That was when we had no way to tell if the umpire was right. Now, we have a dozen cameras, tramlines, hotspots, snickometers, super slomo, and all sorts of other technology to determine if a decision was accurate. Surely there's LESS reason for batsmen to let us know they think they've been robbed. And yet we have Sachin Tendulkar, Gautam Gambhir and Rahul Dravid all looking shocked, and doing a Bollywood act on being dismissed during the current Test. One of those three decisions was incorrect: Gambhir got a snick onto his pad and wasn't LBW. The other two calls were perfectly fine, and the great players who showed dissent only made themselves look foolish in the bargain. Guys, stay dignified, just walk when that finger goes up. The truth will out. Well, the fact is players don't give a damn about the game! They just want 3 things: money, money AND more money. Which brings fame and other goodies(???). Whether they are great or not, best or not, out or not doesn't figure in the equation at all! More footage = More facetime on telecast, and that is what drives them next. well, batsmen are often fined for showing such dissent. but why aren't umpires also fined for their faults? and then again, if they can use a third-umpire for run-outs, why not for lbw decisions too? yeah, it will take a lot away from the game, but then controversies related to bad-umpiring and then their repercussions still dont leave much, do they?